The leaked information flow regarding the as yet unannounced Nvidia GeForce GTX 1660 graphics card continues. 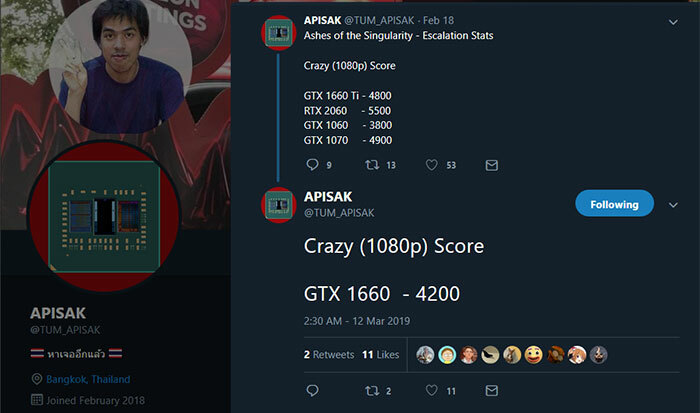 Today Bangkok based Tum Apisak dropped another benchmark result onto Twitter which is purported to come from the GTX 1660 (non-Ti version). 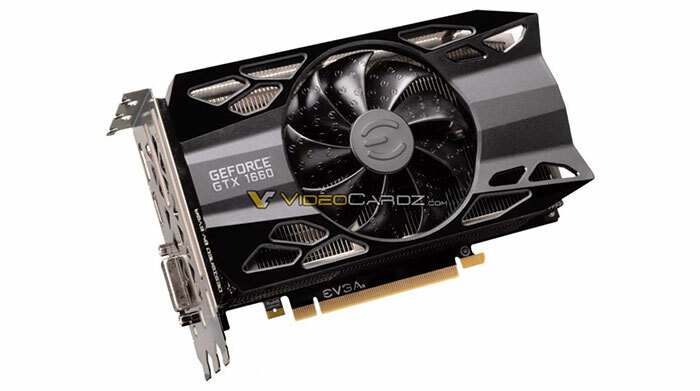 Meanwhile, over at VideoCardz, the site followed up its trio of MSI GTX 1660 pictures with sets of photos showing off similar efforts under the EVGA and Gigabyte brands. Mr Apisak says that all the above scores emanate from the same user, testing various Nvidia GPUs as you can see. A few hours ago he noticed the GTX 1660 score added and it sits pretty neatly between the old GTX 1060 and the new GTX 1660 Ti. The GTX 1660 is about 15 per cent slower than its 'Ti' rival in AotS but its RRP is expected to be approx 25 per cent lower ($219 vs $279). As a reminder the GTX 1660 is supposed to pack about 9 per cent fewer CUDA cores than the GTX 1660 Ti and come equipped with the slower GDDR5 memory. Please take the above info with a pinch of salt. 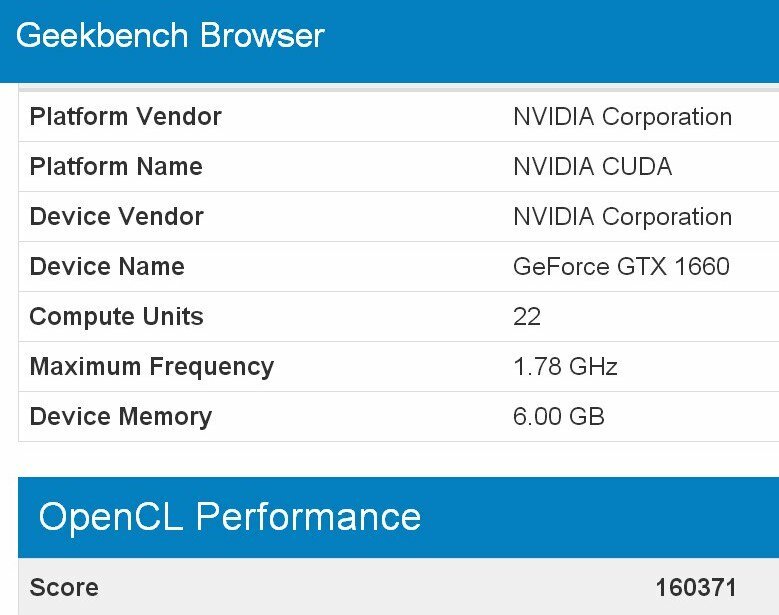 Many expect the GeForce GTX 1660 to arrive by the end of the week so hopefully we can see how the real deal performs in a wide range of benchmarks. Over at VideoCardz there are some more GeForce GTX 1660 product shots available. From the EVGA camp we can see the XC Black and XC Ultra cards with triple slot single fan configuration, and dual slot dual fan configuration, respectively. 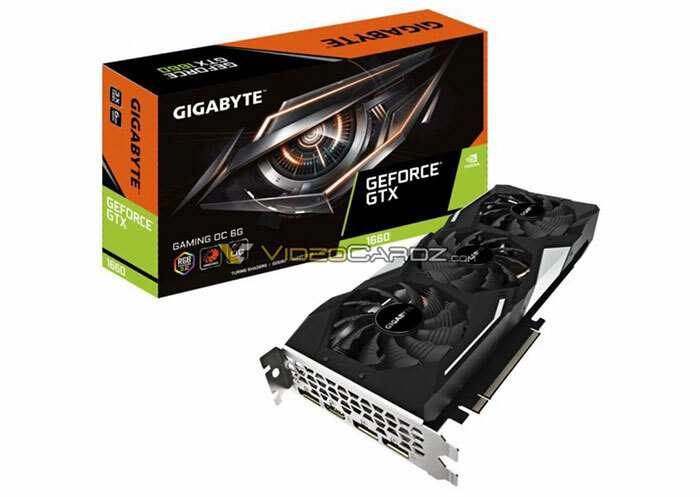 Gigabyte's upcoming GTX 1660 cards are spotted in their OC and Gaming OC versions. VideoCardz comments that all these GTX 1660 cards appear to emanate from AIBs re-using their GTX 1660 Ti designs. Furthermore, it notes that they all come with a single 8-pin power connector. You can see more photos from more angles via the source link. These should slot in around £189 to £199 hopefully, giving the RX580 a run for it's money.